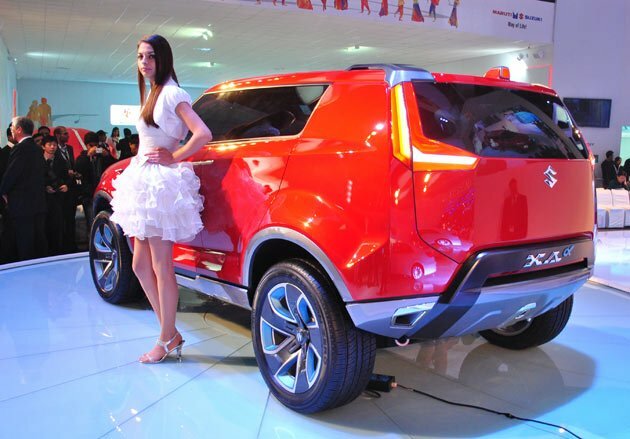 Maruti Suzuki , The leader in the market of Automobile sector in India has unveiled XAα(XA Alpha) a concept for a compact SUV, at Auto Expo 2012 here Yesterday . XAα combines ruggedness and 'muscle' - the traditional attributes of a Sports Utility Vehicle - with elegance, a certain finesse and compactness. In XAα, the 'Alpha' represents trendiness and newness that the youth connect to. The 'A' signifies that this compact, 4 metre long concept, is designed for customers wishing to enter the utility vehicle segment. The 'X' denotes Cross-over category. Presented in glistening Lava Red, the XAα is the show stopper, occupying centre stage at the market leader's Auto Expo pavilion this year. Together with Ertiga, to be unveiled on January 6, the XAα signals Maruti Suzuki's plans to expand into the utility vehicles space. While continuing to strengthen its compact car portfolio, the Company will create new categories in the utility vehicle segment as an option for existing Maruti Suzuki customers as well as for new ones. The Company will back this foray with the best in technology. While expanding its popular range of K-series petrol engines, the Company will build on the success of its diesel offerings. With India on course to becoming one of the leading automobile economies in the world, Maruti Suzuki has lined up a busy product plan to drive the growth and meet diverse customer needs in a fast maturing market. Since the last Auto Expo in 2010, Maruti Suzuki has launched a range of new vehicles. By launching a new WagonR, a new Swift and a new Alto K-10 the Company has been able to maintain its clear leadership, despite several new competitor models in the compact car space. Unveiling the Concept XAα, Managing Director and CEO of Maruti Suzuki, Mr. Shinzo Nakanishi said: "India is set to become one of the top automobile markets of the world. This may become evident as early as the next Delhi Auto Expo. Maruti Suzuki will lead India's automobile growth and evolution by strengthening its compact car portfolio, entering new segments and creating new product categories across fuel options". He added: "The Concept XAα is designed for a market of customers with a young urban lifestyle. This Concept showcases the unified R&D efforts of Suzuki and Maruti which will be a big asset for us in India in the future".